One of the Microsoft products recently announced and released (in “beta” form) is something called ‘Windows XP Mode’. Without getting too deep into the product description, this product will allow you to run older, legacy apps within Windows 7 – and presumably the next version of Windows Server. It may not appeal to the typical end-user, but this functionality is likely critical for corporations looking to adopt Windows 7 within the workplace. It may not be readily apparent to most Windows users, but there is a huge need for legacy application support within any version of Windows. Microsoft would love for each person and each company to immediately adopt the latest version of Windows, Office, Exchange, and every other product they release, but this is clearly unrealistic – both from a cost and support standpoint. Upgrading to the latest and greatest software can be expensive, and in many cases the hardware upgrade needs further compound the cost considerations – especially in the current economic climate. Also, many companies rely upon older, occasionally in-house apps, for the company to function. Rollouts of new hardware, applications, or operating systems are typically methodically planned out and budgeted for. Running legacy applications under the newest (more stable, more secure) operating system is a pretty big boon to many companies. It doesn’t alleviate the increased hardware requirements, but the pricing on state-of-the-art hardware is dropping daily. ’Windows XP Mode’ is really a tweaked version of the Virtual PC platform that Microsoft has had for years. Many companies rely heavily upon virtualization for testing, legacy app support, and lower hardware overhead in server farm scenarios. Rather than a single box running a single OS, which is relatively inefficient, more powerful machines can be running 5, 10, 20 (or more) OSes concurrently – each distinct in and of themselves, but sharing foundational hardware, such as the CPU, RAM, network access, and so forth. This is just one example. The difference with ‘Windows XP Mode’ is the ability to install an application in the virtualized environment, but run it on your desktop machine as a (seemingly) normal, standalone product. 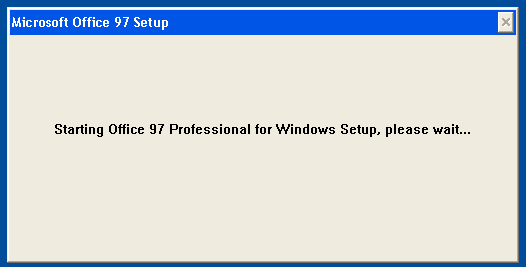 For instance, I may have Office 2007 on my desktop machine, but have a need to test against Office 97 upon occasion. Installing concurrent versions of Office on a single machine typically equals bad mojo. Don’t go there. 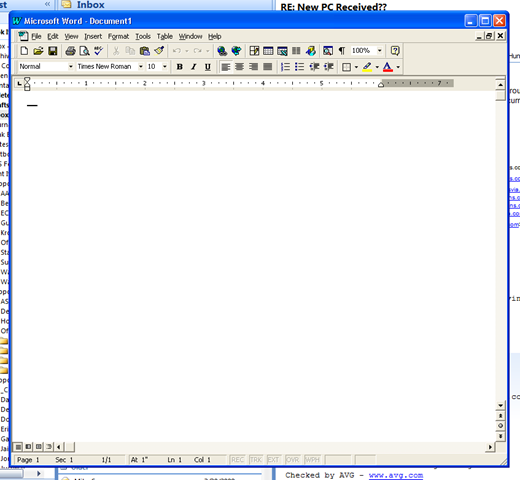 With ‘Windows XP Mode”, however, I can literally have Word 2007 and Word 97 launched side-by-side, though they are technically running on separate operating systems in separate spaces. Pretty cool, and it will really be a life-saver for many companies – including the place where I work. For starters, head over to the ‘Windows XP Mode’ page, check the system requirements, and then download the necessary installers. 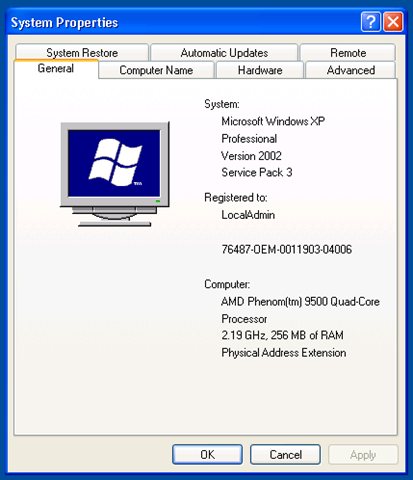 Any new-ish PC running Windows 7 “RC” should be able to support it. 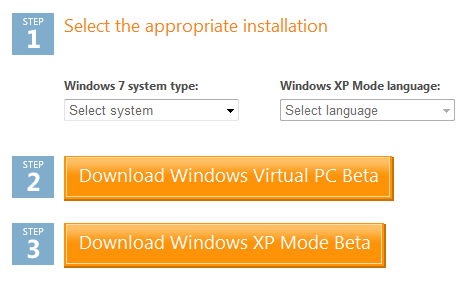 You’ll need to first install a Virtual PC “beta”, and then the ‘Windows XP Mode’ “beta”. Sadly, running the ‘Windows XP Mode’ installer first didn’t inform me that I was missing anything, so I was a bit confused. Follow the steps and you should be ok.
Once you’ve walked through both installers and rebooted your PC, you should be ready to launch ‘Windows XP Mode’ for the first time. 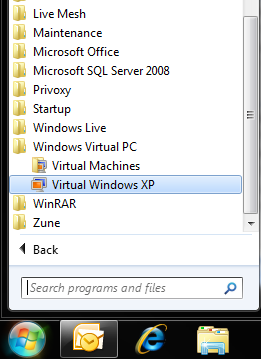 Note that it’s referred to as ‘Virtual Windows XP’ in your Start Menu. I don’t know what name they’ll eventually settle on. 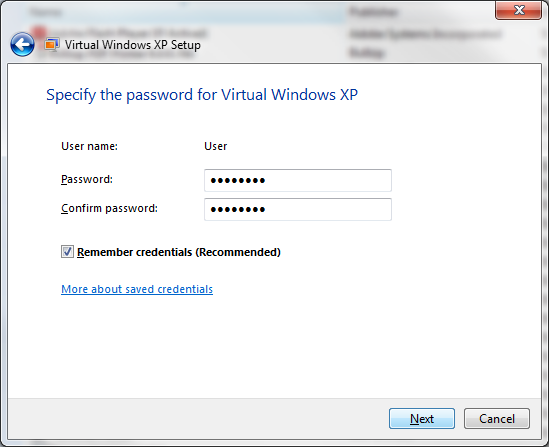 You are prompted to provide a password during the ‘Virtual Windows XP’ initial setup. The username cannot be changed, so don’t try it. It’ll be interesting to see how security issues are handled in the long run. Will the ‘Virtual Windows XP’ session make the host PC more vulnerable to malware and/or viruses? Is it segmented from the host PC? Questions that I do not yet have answers for. Once the setup is complete, you are presented with a typical Virtual PC-type session of a Windows XP desktop. It is quite simply just Windows XP (SP3) running in a Virtual PC environment. Nothing fancy here. 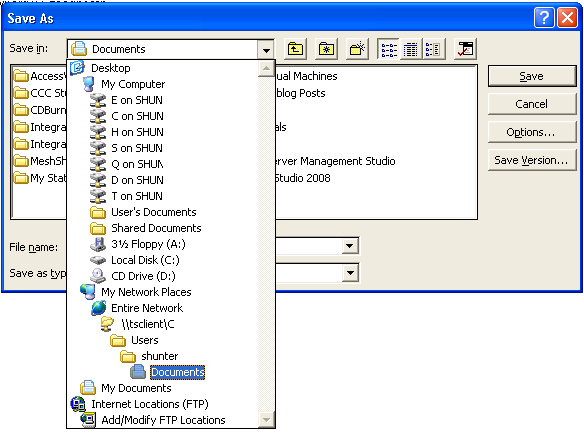 Interestingly, ‘Virtual Windows XP’ automatically maps the drives available on your Host PC. 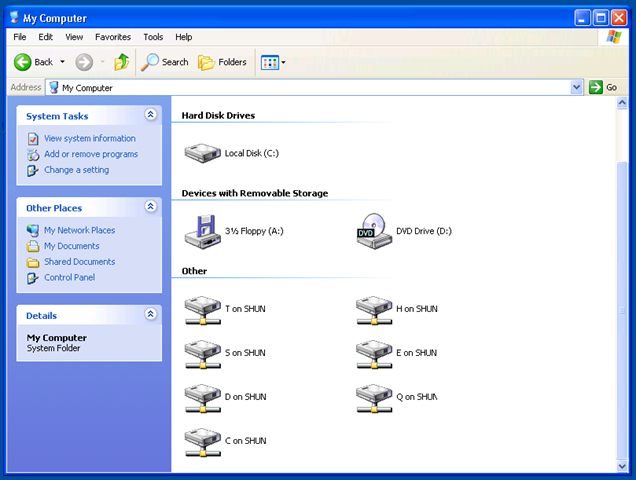 For instance, our corporate S: drive (containing software installs, etc.) is immediately available within the ‘Virtual Windows XP’ session. My test install of Office 2000 ended in a “fail”. 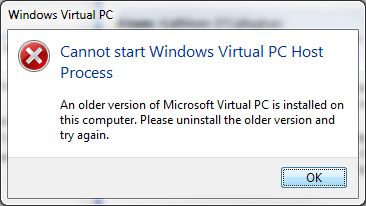 It thought that I was installing from a Remote Desktop session, which is somewhat strange. 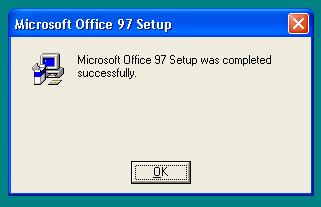 Better yet… let’s try installing Office 97! The setup launched and completed without a hitch. 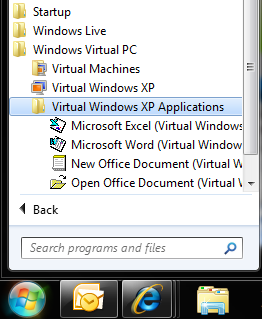 Without really knowing what to do next, I closed the ‘Virtual Windows XP’ window like I would any other application. A very brief “hibernating” dialog box showed up, and that was that. In my Start Menu once again, I now have a listing for ‘Virtual Windows XP Applications’, which was populated automatically after the Office 97 install. 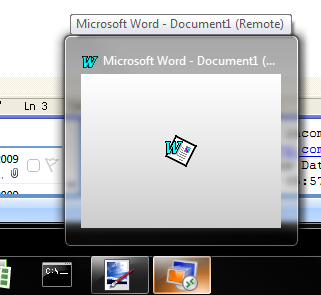 I simply click on ‘Microsoft Word’ like I would any other application, and away I go! My initial launch gave me an interesting screen making reference to my previous “logoff” and what I’d like to do next. I chose the ‘Open Virtual Application’ option and continued. The ‘Starting Virtual Application’ dialog. This seems to be pretty standard when starting your first virtual app session. 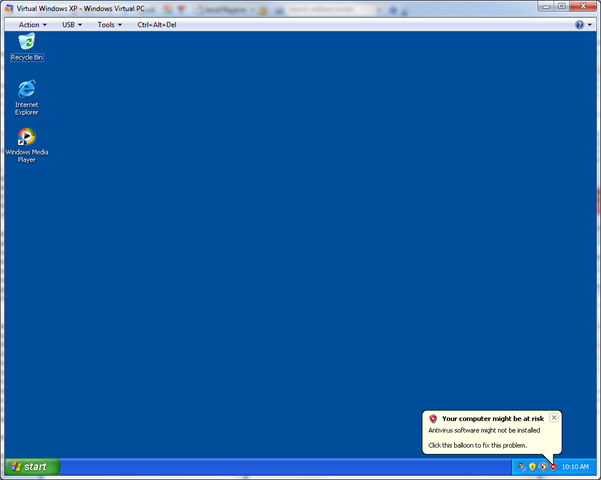 After a brief flash of the Virtual PC desktop (strange! 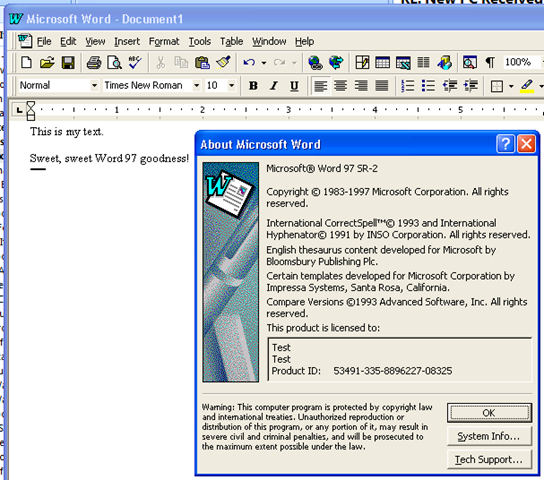 ), Word 97 was up and running in its own windows space – just like any other app. For whatever reason, it started out stretched across my dual-monitors. After a quick resize, it was fine. The ‘Save As’ dialog in Word 97 has access to my same mapped drives. Also, the ‘My Documents’ folder maps to the same location as my Host PC. It looks a bit strange in this form, and could confuse some users. Still, I’ve performed nearly no configuration during this process, and I can save a Word 97 document to my network share. That’s kinda cool. The taskbar icon doesn’t really show me that Word 97 is currently open. Rather, I have a generic ‘Virtual Windows XP’ icon. Mousing over the icon, however, gives a bit more information. Closing Word 97 is completely uneventful. It closes like any other application, with no further dialog boxes or adverse behavior. Is ‘Virtual Windows XP’ off at this point? I don’t know. Presumably it hibernates quickly upon closing. For the most part, ‘Windows XP Mode’ (aka ‘Virtual Windows XP’ aka whoknowswhat) has met my expectations. Aside from the initial install confusion on my part, everything went pretty smoothly. This page helped clear things up. Having installed apps automically show up in the Start Menu of my Host PC was unexpected, but a very nice surprise. Performance seems reasonable, with initial application start times of around 30 seconds (resuming the virtual OS from hibernate, it seems) and consequent application launches being almost instantaneous. I have yet to perform any real testing of the virtualized applications themselves. As I mentioned previously, this functionality is a huge boon for many companies out there, while most home users will either be unaware of this product, or won’t care. Clearly the product needs polish – especially around the install process and application “launch” strangeness – but is otherwise a pretty impressive outing. I look forward to testing additional applications and subsequent releases of ‘Virtual Windows XP’.